Formulation of common research priorities for future cooperative projects, and exploration of funding opportunities at the national and international level. 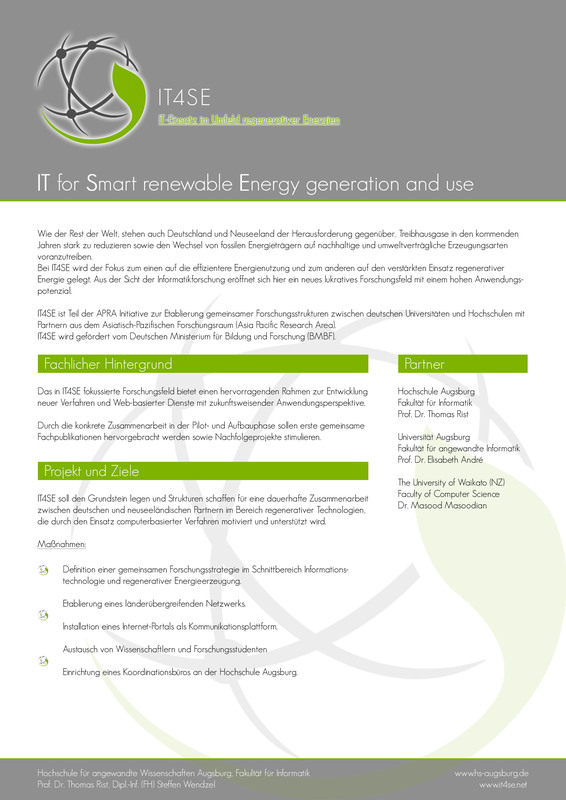 Establishment of a network of stakeholders from research, industry, and other associations and individual users interested in intelligent generation, monitoring, and use of renewable energy. Set-up of an IT4SE internet portal for the purpose of supporting the aforementioned network. The portal will serve as a point of contact and support the sharing of information. The portal will also gradually provide a framework for hosting services related to intelligent generation, monitoring, and use of renewable energy. Exchange of researchers between the partner institutions. Guest researchers will contribute towards the objectives of the related collaborative research projects, including the development of the first demonstrative service for the IT4SE internet portal. Set-up of a coordination bureau at the University of Applied Sciences Augsburg for handling organisational and administrative tasks. You can find additional flyer/poster material of our projects on the project information website. IT4SE is part of the APRA initiative on the establishment of joint research structures between German universities and partners in the Asia Pacific Research Area. As all APRA projects IT4SE is funded by the German Federal Ministry of Education and Research (BMBF).